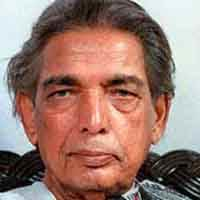 Kaifi Aazmi was a famous Hindi and Urdu poet and lyricist of Hindi film. He was born on Januray 14, 1919 in a landlord family of Mejwan, Azamgarh, Uttar Pradesh. Aazmi abandoned his studies of Persian and Urdu during the Quit India agitations in 1942 and shortly thereafter became a full-time Marxist. During this period, Azmi started to win great acclaim as a poet and became a member of Progressive Writers' Movement of India. Later he went to Bombay and joined Ali Sardar Jafri in writing for the party’s paper, Qaumi Jung. In 1947, he visited Hyderabad to participate in a mushaira. There he met, fell in love and married a woman named Shaukat Azmi. She later became a renowned actress in theatre and films. Azmi's first collection of poems, Jhankar was published in 1943. As a lyricist and songwriter, though he wrote for numerous films, he will always be remembered for Kaagaz Ke Phool (1959), Haqeeqat (1964), Heer Raanjha (1970). Azmi died on May 10, 2002. He was the recipient of Padma Shri, one of the Indian Government's highest civilian awards. Besides he was awarded the Uttar Pradesh Urdu Academy Award, Maharashtra Urdu Academy Award, Delhi Urdu Academy Award. He has also been honoured with a doctorate from Vishva Bharati University. He died in 2002.